The Year In Review – Part 1. When I say “The Year In Review” I don’t mean that I’ll be reviewing what has happened on TV and so on in 2015, but I’ll be having a look back at what I have achieved on the first year of this blog, and my plans for the future. In part one let’s determine the progress that I have made on the various things that I like to write about on here. CBBC Memories. I have enjoyed writing about some of my favourite CBBC memories. There aren’t too many more shows left for me to write about now, just some cartoons plus a few other things. CITV Memories. Again like with CBBC there isn’t much more beyond some cartoons to write about now. But when I wrote about The Adventures Of Captain Zeelig which caught people’s attention I was very pleased because I realised that doing this might be worth it. My piece received a link on the UK Game Shows website and I even got a reply from someone who was a contestant on the show. The Comedy Vault. I’ve already shared lots of memories of some of my favourite comedy sitcoms and sketch shows from over the years. I still have some more to write about. I’m particularly looking forward to telling you why I like The Brittas Empire which turns 25 next month. Comic Memories. I have enjoyed sharing memories of my favourite comics where I picked out one issue to review. Next I plan to look at the history of various comics, some of my favourite characters, and also review some more of my favourite artists. Game Show Memories. This is of course something that I am a big fan of and have written about a lot. I’ve now shared the majority of my favourite game show memories, but there will be more, and I’ll also be looking back at some of my favourite hosts, and I plan to do another first and final series comparison piece, this time on Blockbusters. Gaming Memories. I started out by having a look back at some of my favourite gaming magazines because I felt they deserved some more recognition, and I’ll continue to share some more of my favourite games on various formats. More TV Memories. This is the section where I look back at various shows. It was originally called “Obscure TV Memories” but someone seemed to object to the use of the word “obscure” so let me just clarify. I am not one of those people who insists that “obscure = good and mainstream = bad”, the original idea was to write about some less-famous programmes that there is little information on the internet about in the hope that if someone does remember them and does a search this site might be the first place that they come to. I did plan to make people more aware of shows that I have liked including The Winjin’ Pom, Harry And Cosh, Glam Metal Detectives, My Wonderful Life and others and still we wait for these shows to come out on DVD. I have also written about the likes of Noel’s House Party and You’ve Been Framed which are definitely mainstream but I still a big fan of them. As well as more lost gems or known favourites to write about, I’ll also write some more about my OnDigital and Freeview memories. Musical Memories. I started doing this section by picking a singles chart at random and choosing my favourite songs from it. Soon I plan to reveal some of my favourite acts and look back some of my favourite hits from a particular year. I’ll also get around to reviewing another classic edition of TOTP eventually. Round The Regions. This is a feature that has now ended but I very much enjoyed looking at the various presentation of ITV regions in their 60th anniversary year, it’s great that there is so much archive now online. Saturday Morning Memories. I have now finished sharing my memories of CBBC/CITV Saturday Morning shows, it was great thinking about the likes of Parallel 9 and Motormouth again. The YouTube Files. I’m always on the search for enjoyable things on YouTube, such as TV programmes that I might not remember from the first time round or just generally unusual moments. I recently found an interesting video featuring a newsflash of a famous moment so I’ll use that to take an opportunity to look at various news presentation soon. Next time in the second part I’ll be revealing what my most viewed pieces are and what I’ll be doing on here over the next year. Thanks for your interest in what I’ve had to say this year. More TV Memories – Startups. Just when I thought that I had reviewed every element of classic TV presentation, from having a look back at the ITV regions over the years to closedowns, I have realised that I haven’t looked back at startups yet, so here’s my review of those. Just as closedowns would end the day’s programming, startups would begin them. I must admit that startups on ITV are before my time, but as ever I have watched several archive clips of them online, and I do find them rather curious. Although it would vary from region to region, the startup process would be mostly the same. At around 9:30 a caption would come on the screen featuring the region’s name and an solemn announcement informing us that the region was “providing a full colour service on the transmitters of the Independent Broadcasting Authority”, as if they felt that they had to thank them every single day for the honour of being able to provide programming to viewers. Then there would usually be a short piece of music over this caption, some of these pieces were used for a long time so they became familiar to viewers in their various regions that they were used. For example Thames used to use a classical piece called “Perpetuum Mobile”, before then their own classic “Salute To Thames” which was played over the mankiest slide of the Thames ident that they could find. It just seems so odd now that they would have to spend about ten minutes settling in before you would see anything else. After all this ceremony, the continuity announcer would finally start the day by introducing a lineup of forthcoming programmes and usually informing us about what the weather was like before the first programme, which is these days was usually for schools. After the launch of TV-am in 1983, the startups would occur at 9:25am. LWT also used a famous piece of music for their startups called “A Well Swung Fanfare”. 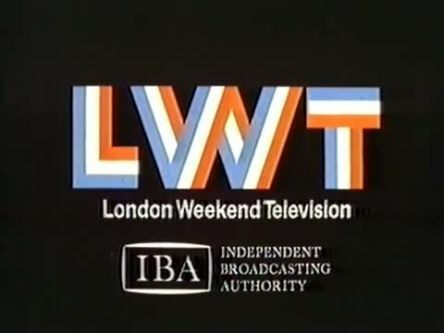 As a tribute to this, on their final day under the LWT name in October 2002 a recreation of a startup was shown which was a nice touch. Some regions would also feature various things in their startups such as a short film of landmarks around the region. By the mid-1980s the startup process began to be phased out by the regions, and by the time 24-hour programming had come to every ITV region in 1988 there was no longer any need for a startup routine as all regions would now be on all day. More TV Memories – Family Guy. “It seems today that all you see is Family Guy on TV…” so the opening theme (almost) goes. But this isn’t going to necessarily be a piece about my favourite episodes or characters as such, it’s going to more be about the history of the scheduling and promotion of Family Guy when it was first shown in the UK in 1999. There were already a lot of great animated sitcoms on TV at the time including The Simpsons, South Park and King Of The Hill. 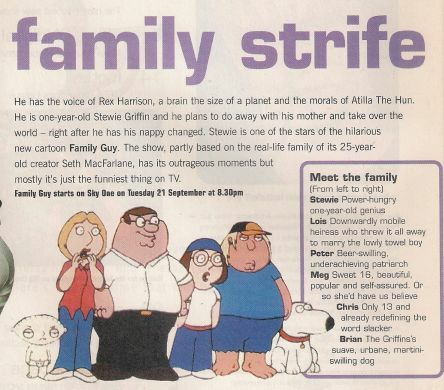 Somewhat unsurprisingly when Family Guy launched a lot of the publicity consisted of “if you think that the Simpsons are crazy, just wait until you see this lot!”, and the fact that the creator of the show and provider of some of the voices was newcomer Seth MacFarlane who was only 25 at the time. 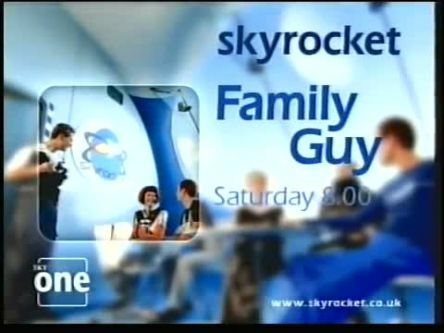 We first met the Griffin family in the UK when the first episode was shown on Sky One on 21 September 1999 at 8:30pm. The main characters included Peter who worked at a toy factory, who some viewers complained was just a Homer Simpson clone, Brian the talking dog, and there was also the one-year-old son Stewie who has an English accent and originally was something of a nasty and matricidal character, but he has changed over time into a rather camp inventor of time machines. 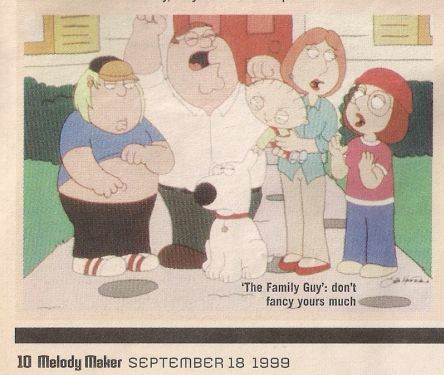 I still have a few articles about the launch, including one from Melody Maker (which incorrectly refers to the show as The Family Guy throughout). I will always associate Family Guy with the animated science-fiction sitcom Futurama, because it launched in the UK on the same day. This actually gained more publicity at the time because it was the first new show created by Matt Groening, the brain behind the massive success of The Simpsons. I still remember watching the earliest episodes, with the famous cutaways already established. It is a surprise how scruffy the animation on the early episodes is compared to now, but they still look better than the first series of The Simpsons which looks like it was drawn with crayons now. In more recent years even Family Guy referenced the launch with an episode called “Back To The Pilot” which mocked the animation mistakes, unsettled characterisation, and a different actress providing the voice of Meg. I did like Futurama and Family Guy and watched regularly, even going as far to buy the first series when it was released on VHS. Yes, it was that long ago now. 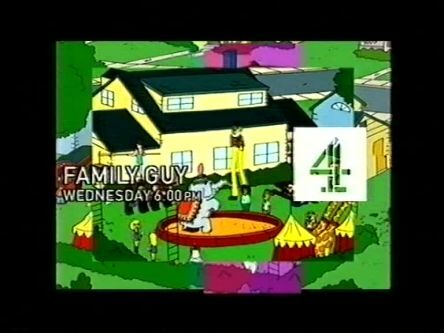 Family Guy was first shown on terrestrial television in the UK in August 2000 on Channel 4 but they really didn’t know what to do with it. For a while it was shown at 6pm (the same timeslot in which they now show The Simpsons), and after a while it oddly got moved to the afternoons, meaning it ended up being edited. The first episode of Family Guy was shown in America in January 1999 after the Superbowl so it attracted big ratings. After a few series though it was cancelled, but good DVD sales meant a revival, and the show continues to this day, with another new series starting in America soon. After a while Sky One and Channel 4 stopped showing Family Guy and it moved to the BBC, with BBC3 repeating episodes endlessly on an almost daily basis and the show finally gaining in popularity. After the success of Family Guy, Seth MacFarlane went on to launch a second animated sitcom, American Dad. 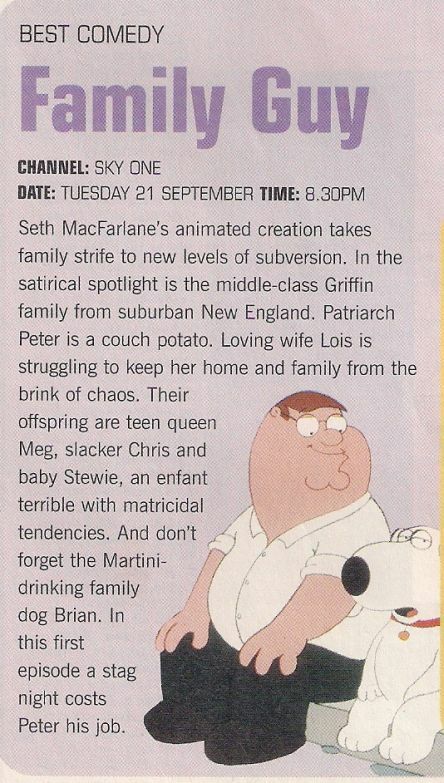 Soon Family Guy will be shown on ITV2 for the first time, presumably they think that they are going to have success with the show. Do Sky One and Channel 4 now regret losing the show? I can’t believe that I have been a fan of Family Guy for almost 16 years now. More TV Memories – Channel 5. 1997-2002: There have been four different eras of presentation on Channel 5. 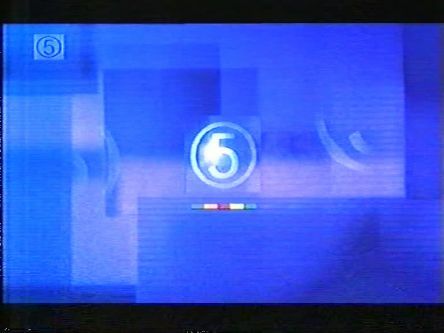 Before the launch in 1997, a lot of media publicity and test transmissions prominently featured five colour bars along with the symbol which was a “5” in a circle. 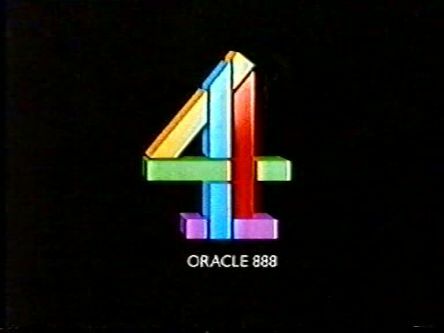 When the launch finally came I was surprised that the colour bars didn’t feature too much in the main idents, which featured the symbol appearing on various backgrounds. I think that these worked well though and definitely gave the channel a look that was distinctive. Also, Channel 5 never used a clock and have never closed down, being on air 24 hours since day one. I did like the early days of Channel 5 and watched a lot of programmes, they weren’t exactly big budget or highly rated but at least they had a go, and they were pioneering in their news coverage. 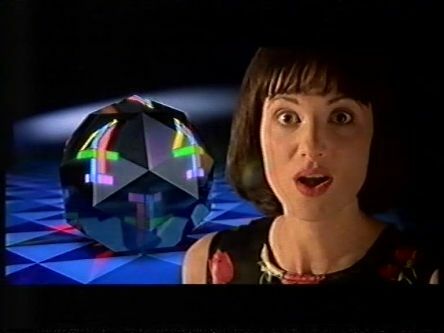 Around 1999 Channel 5 introduced a new wave of idents but they retained the symbol. Most of these were celebrity idents, a little like what Channel 4 did in their circles era, featuring various personalities on the channel. 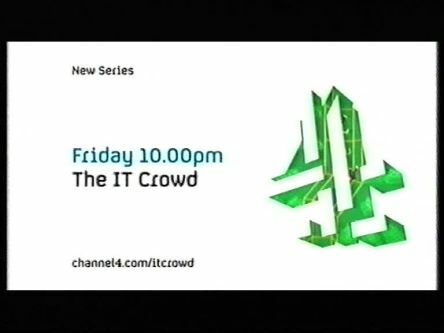 Of course, ITV1 would do something like this a few years later too. 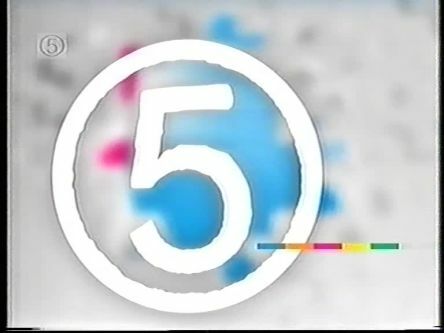 There was one more change to the idents in March 2002 which dropped the celebrities but still kept the symbol and colour bars appearing on various coloured backgrounds, and also included a five-note piece of music. Around this time slides were dropped too. Looking back it is a surprise to realise how long this look lasted. 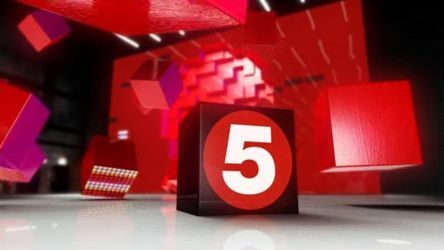 2002-2008: In the second era the decision was taken to give the presentation a complete overhaul and rename the channel “five”. 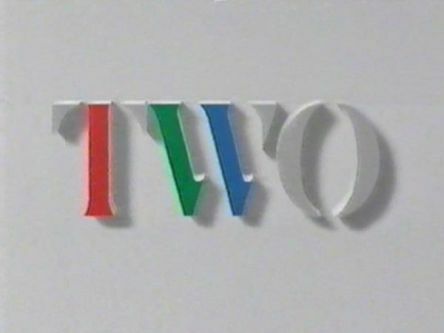 There was a new wave of idents which featured the name of the channel appearing on the right of the screen. This was yet another group of lifestyle idents, similar to the current ITV look, but these were really dull, with barely anything happening in them. Also, “five” would appear in a different colour for every trail, again similar to current ITV. Some more adventurous idents were added over time with the symbol appearing in unlikely places, and curiously some near the end which didn’t feature the name of the channel at all, but other four-letter words, and it was odd seeing programmes introduced with vague messages such as “fast” or “love”. 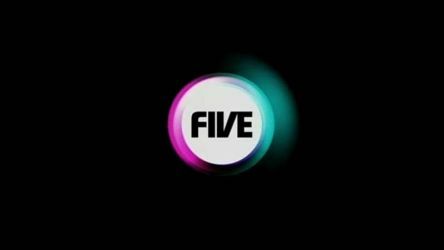 The first wave of five’s spin-off channels launched around this time too. 2008-2011: The third era featured the symbol now being in capitals and changing to “FIVE”. The idents around this time were very creative and unusual, featuring things such as invisible superheroes, and enormous drums. The look wasn’t developed too much though, being used for barely two-and-a-half years. 2011-present: The fourth era saw the channel reverting back to being called “Channel 5” again after nine years, not that anybody ever stopped calling it that. The current group of idents take place in a space with a big red screen, where various things happen and then the “5” symbol forms in a circle, looking a little like the original 90s symbol. Circles on red backgrounds does make it seem rather similar to BBC1’s current look. There also some variations made for specific programmes, including 30 years of Neighbours. There’s even a sombre ident for going into the news, they’ve thought of everything! I don’t have a problem with these idents, and I don’t feel that there is any need to change them any time soon, even though they have now been on screen for almost five years. It’s just a shame that most of the programmes are so rotten now. 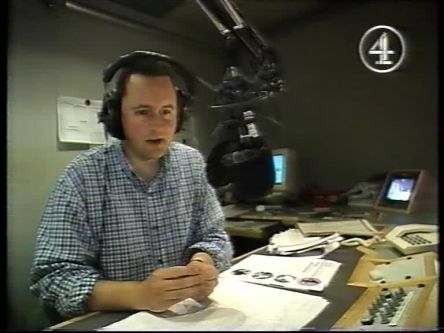 More TV Memories – Channel 4. 1982-1996: There have been five different eras of Channel 4 presentation. The first began when Channel 4 launched in November 1982. Their first ident was groundbreaking in many ways. It was one of the first anywhere in the world to be computer-generated and was created using the latest technology of the time, and there were also multiple idents for the first time, with six different variations created. 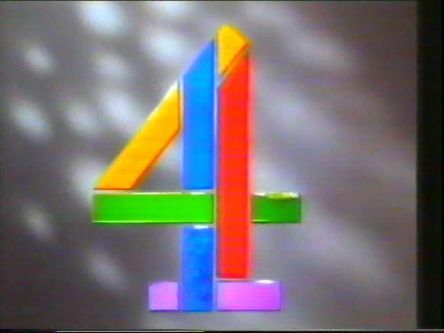 Channel 4’s original ident was made of five colours and split into nine different blocks, and it was soundtracked by a piece of music specially made called “FourScore”. The ident made such an impact with viewers that a variation is still used today. I do think that it is a great ident myself, definitely up there with the BBC2 1991-2001 look for the most creative way that a channel ident was used and it fitted the channel’s programming and ideas perfectly. In the early days in-vision continuity was used but only occasionally, and there was also a clock but that was only usually seen before the news and closedown. Over the years several variations were used in trails and idents for special seasons. 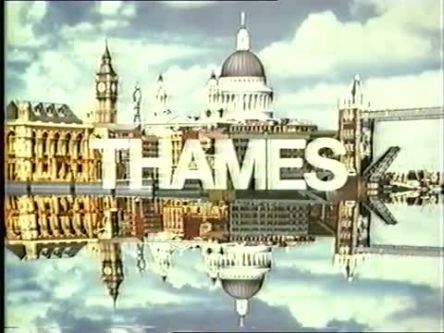 By 1992 a new soundtrack was used for the idents, and more often in the later years of the look programmes were introduced by various personalities who were featuring in programmes currently on Channel 4. After just over 14 years the decision was made that it was time for a change. 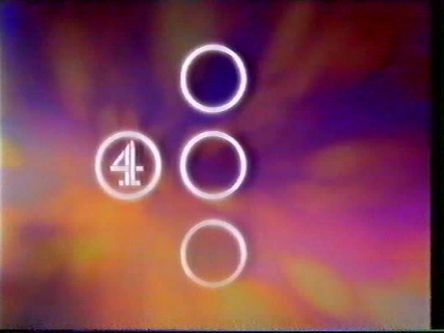 1996-1999: Channel 4’s second era featured four circles, which contained the Channel 4 symbol inside one of them. What disappointed me about this look was that the 4 was now colourless and did nothing, just appearing in one of the circles, and that was about it. There were lots of new idents, with most of them again referencing the programme they were about to introduce. Channel 4 also went 24 hours in the early days of this look, meaning no more closedowns. The only creative variations in this era were the special idents introduced for the 15th anniversary in 1997. Channel 4 did use in-vision continuity again, but it was only a small camera in the announcer’s room. There was no clock by this point and also a generic look was introduced to some extent with all trails finishing in the same way, although this was dropped after a while, with even Channel 4 seemingly becoming dissatisfied with this look after just a couple of years. 1999-2004: Channel 4’s third era moved their symbol from being inside a circle to a square. Again the “4” didn’t actually do much in this era. It was something of a transition time for television when this look was introduced, digital television and widescreen was in its earliest days, and Channel 4 also launched some spin-off channels including E4 in 2001. 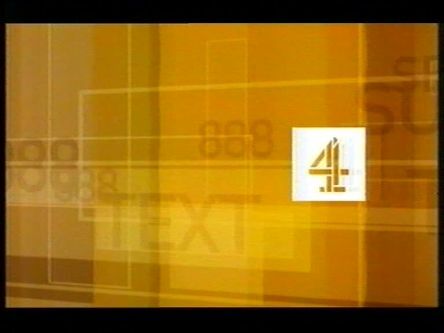 There were various idents at the start of this era featuring scrolling stripes in different colours, plus a few again featuring Channel 4 personalities, but these were changed after a while, and again there were lots of creative variations. Trails were also in the same style and slides were used in the early days too. 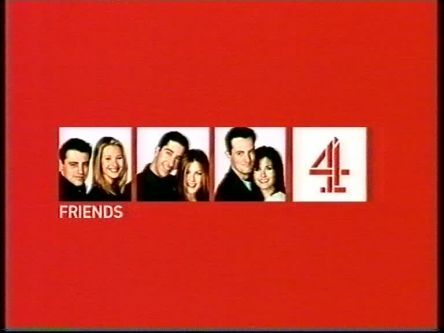 2004-2015: With the fourth era there was another new set of idents. Various shapes floated in the air and as the camera moved around they created the “4” symbol for a very short time. This suggests that the symbol is now so familiar that it needs to only appear on the screen for a second to be identified by the viewers. One thing that I like about this look is that it was great seeing the “4” symbol being used creatively again, with it magically appearing in markets, fields, motorways, and many other places. 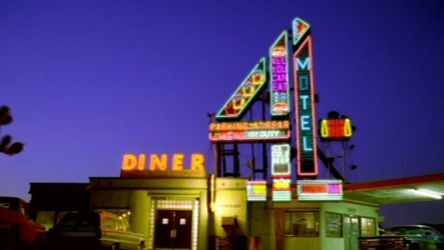 My favourite one is the diner because that’s the one that most reminds me of the original Channel 4 look. Trails feature a 3D version of the symbol. 2015-present: The fifth era of Channel 4 presentation launched in September. The new look seems to have taken the idea of the “4” symbol appearing onscreen for a very brief time and taken it to the extreme – the “4” symbol as such doesn’t appear at all now fully formed – most trails just feature three or four of the nine individual blocks from the symbol as if to say it is now so familiar we can still recognise it. There are also lots of colour combinations and many variations have been made. The idents themselves though are very peculiar and almost defy description, I certainly haven’t been able to decipher them yet in the short time that they have been on air. There are currently four of them and again they don’t prominently feature the “4” symbol in full or otherwise. Maybe as time goes by it will all begin to make sense as the story is told. It’s definitely got people’s attention though. More TV Memories – BBC2. 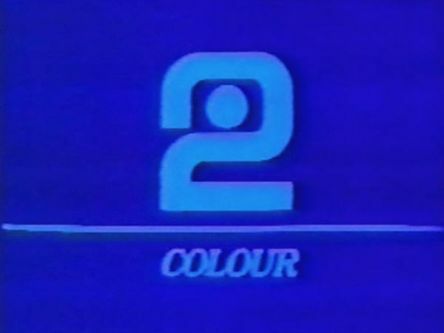 1967-1974: Three years after the launch of BBC2, they became the first channel in Britain to show programmes in colour, and their ident at the time featured a “2” which would rotate and be in various colours, but after a while changed to only being blue. Also during this time a clock was used and unlike BBC1 there was no national anthem played at closedown. 1974-1979: The next symbol featured a “2” that was made up of several blue and white stripes, with turned around to create the symbol. Occasionally the background would change colour. 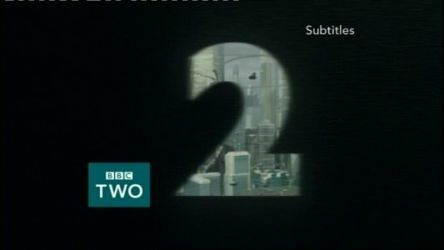 This was the last time that a mechanical ident would be used on BBC2. The clock design was the same as in the previous look. 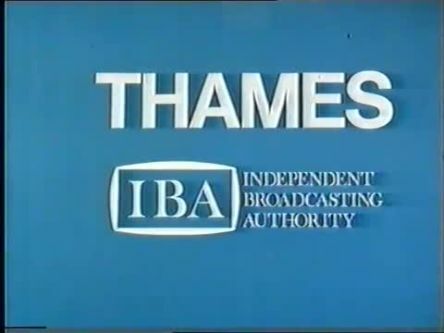 1979-1986: The next ident was far more technically advanced. It featured the “2” made up of white and orange stripes. 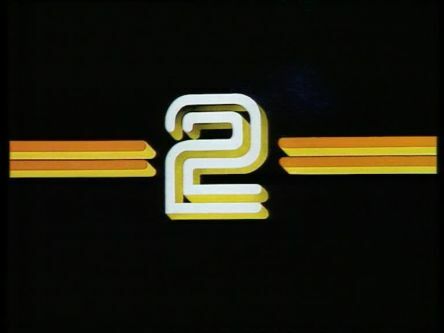 It was the first computer-generated ident and was played live at the start of programmes. For a short while it was also accompanied by a short jingle before the first programme of the day. 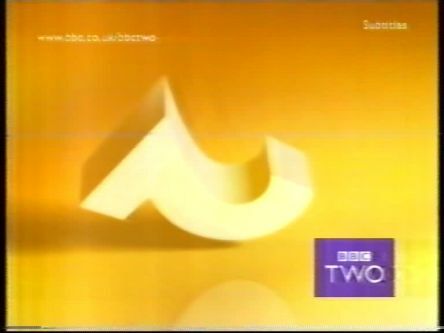 When schools programmes moved to BBC2 a variation of this ident was created which featured a yellow background. Also during this time the clock was upgraded from analogue to digital. 1986-1991: Another change and now the symbol says “TWO”. The letters would sometimes appear or disappear in the ident. Many people feel that this ident now captures its era as featuring rather dull and highbrow programming. What strikes me about the ident is like its predecessors it doesn’t feature “BBC” at all in any form, in an era where branding is seen as so important is just seems rather strange now. 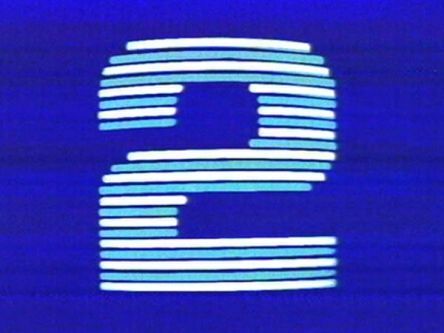 1991-1997: The ident is relaunched and now features the most famous “2” symbol of them all. It has become as associated with BBC2 as closely as Channel 4’s symbol has with its programmes, making it all the more surprising that it was introduced 27 years after the launch of BBC2. The ident finally featured the BBC symbol and for the first time several variations were made, all featuring the same colour and a powerful and innovative soundtrack. Like BBC1 which relaunched on the same day there were also various trail styles, although as BBC2 was the more alternative channel some of their stings were a little more unusual. There were also several variations of idents made for special seasons of programming and this era is still considered to be among the best presentation that the BBC has ever had. 1997-2001: When the BBC symbol was changed, they couldn’t let the look go, so it was retained, with ever more odd idents added. By the end some of them were getting a little too far away from the original idea, with the “2” being turned into all kinds of unusual things including a Venus Flytrap and a kebab, but it still worked. Also around this time slides and the clock began to be phased out which was a shame because I always felt they worked well and were part of the all-round package and image of a channel. 2001-2007: After almost 11 years, a whole new look was introduced. By they just couldn’t get rid of that “2” now, so it was retained, and now gained a personality! All the idents were now on a yellow background and featured the “2” doing various things such as using a paintbrush or just bouncing around. Again more were introduced as time went by. This series of idents never seemed to be as popular as the previous era but I still think that they were a decent evolution of the idea. 2007-present: The idea was now “the window on the world”. Various things would happen through the shape of the “2”, such as looking through a zoetrope or a car mirror. Like with what happened to BBC1, after about a couple of years, some idents were dropped and the remaining ones were re-edited. That’s how it stayed for a while, but then something rather strange happened. 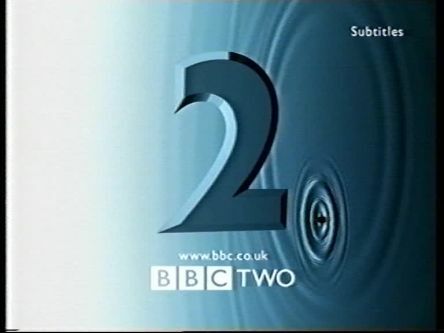 In 2014 to celebrate BBC2’s 50 anniversary, some old idents were brought back, mostly from the second generation (1997-2001) of the “2” idents. It was good seeing them again, but then they continued to be used in place of a new look, although the current look doesn’t seem to have been officially retired. One ident from the first generation has now turned up, and it is odd to think that look was introduced almost 25 years ago now. After being so well unified, the look of BBC1 and BBC2 now seems all over the place and somewhat tired, maybe there will be another generation of idents soon. If you’ve got an idea and a million quid I’m sure they’ll be glad to hear from you.